This is Part 1. Once you finish Part 1 click here to go to Part 2 and learn exactly how to set up a separate Post Type for your Landing Pages and much much more! Landing Pages are one of the most essential parts of Paid Marketing. This video and written tutorial is all about how you can use Builder Beaver to build Landing Pages ridiculously fast. Best of all? It’s all WordPress – no third-party platforms and expenses. This tutorial will be extremely valuable to you if you are trying to promote your business through Paid Marketing on Facebook, AdWords, or any other marketing platform. It can be an incredible choice way to do A/B testing for your landing pages. If you have not yet used the Beaver Builder page builder for WordPress, click here to try the demo of Beaver Builder. For me personally I try and use WordPress for as many things as I can. It integrates with a lot of things and all my integrations center around my WordPress. For example, Active Campaign is set to track what people do on my website and then sends Beyonders like yourself only the emails they need to receive so we here at BeyondBeaver.com can provide the best possible content to each user based on their needs. I’ve also already paid for softwares like Gravity Forms and Beaver Builder because I use them for the client websites I do so it makes sense to use something I am paying for rather than pay for another service. And I am used to building pages with Beaver Builder. Beaver Builder is really quick in itself and I’ve used it A LOT and can do things very fast with it as I am sure you are too. What’s more, is my Google Analytics tracking is set up, form entries save in Gravity Forms for exporting, I can ask questions in the extremely responsive Beaver Builder community. I could go on and on but in the end Beaver Builder is just the right solution for me and my Landing Pages and I recommend you give it a try also. 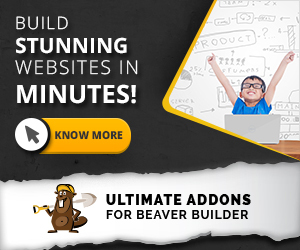 Keep reading to see how you too can build Landing Pages with Beaver Builder ridiculously fast! Ok, lets get dug in so I can show you how easy it is to create Landing Pages with Beaver Builder. This tutorial will show you how you can use the Beaver Builder Landing Page templates in our store as a starting point for your landing pages. You could, however, start with your own design. To see our incredible range of Beaver Builder Landing Page Templates that you can use to design landing pages ridiculously quick, click here to see our Beaver Builder Landing Pages. Scrolling down the page you will find (at this time) 16 incredibly designed Landing Pages Templates. Pick the one that you think is inline with your business’ promotion (or read to the end of this post for an exclusive special offer on all these Landing Page Templates). You can demo the Landing Page Template you’re interested in by clicking on the Live Preview option. To purchase one of our Beaver Builder Landing Page Templates, simply click on the Template you like in our Shop and then click on Add to Basket. Next, proceed to checkout and make your payment. Once the payment is complete, the downloading options will be available to you on the order receipt page. Alternatively, you can go to My Account > Downloads. Click on Downloads and you will be able to see the Landing Page(s) that you have just bought. Click on the Download link next to the Landing Page Template you’ve just purchased and save it to a location on your computer. This will be a .zip and inside will be your Landing Page .xml file that you’ll import into WordPress in Step 2 of this tutorial. To import your new Beaver Builder Landing Page you do it the same way you’d import Posts and other post types into WordPress. Download the Landing Page template from your My Account page on BeyondBeaver.com as explained above in Step 1. You will get a .zip file. Download the WordPress Importer by logging into your WordPress Dashboard and going to Plugins > Add New and searching for WordPress Importer. Extract the .zip template file you have just downloaded from your My Account and you will then see a .xml file which contains the actual template file you will import. Go to Tools > Import > WordPress and import the template .xml file. NOTE: selecting or not selecting the checkbox to “Download files and attachments” will make no difference due to the way Beaver Builder stores images in the template files, so we recommend just leaving this box unchecked. Edit a Page using Beaver Builder like you normally would and up the top in the Beaver Builder Toolbar click on Templates. When in Beaver Builder, select Your Templates in the drop-down and you will now see your new Landing Page Template(s) that you’ve just imported. Click the one you want to use on this page for the Landing Page and then begin editing like normal. Beaver Builder makes editing your content extremely easy. The hardest part for most people using Beaver Builder isn’t the editing but rather the design. I mean, a blank screen. Yuk! Everyone struggles with starting a design from scratch. That’s why we’ve made these Beaver Builder Landing Page Templates. We were struggling to design Landing Pages from scratch and now we use these Landing Page Templates. We import, change the text and photos and we’re done. With our Landing Page Templates there’s limited thinking needed. Especially in terms of design. You just fill them in with your own content. We’re using the Templates do get Landing Pages up in 15 minutes and you could do this too. You can start advertising on AdWords or Facebook, or whatever you’re using for paid marketing, within the hour with Beaver Builder and our templates. EXCLUSIVE! Get 16 of our professionally designed Beaver Builder Landing Page Templates now and save $247! This tutorial has a surprise product hidden in it, a product which is not available among the products on BeyondBeaver.com. You can get 16 Landing Pages Templates for just $97. How much do you save? A whopping $247!!! Included in this Landing Page bundle are templates for weddings, webinars, e-books, real estate, countdown timers, and so many more. I used one of them just last week and created the landing page for my Online Course (click here to see) in literally minutes – from designing to setting it up to link to my Active Campaign list, to replacing the content – everything in just 15 minutes. Isn’t that great? And, you can take a step further to advertise it on Facebook or elsewhere, just like I did, to have the paid traffic pouring in. Don’t let the deadly white page stop you from reaching your goals and getting your tasks done fast. Click here to see this secret product and get 16 Beaver Builder Landing Pages and save $247.